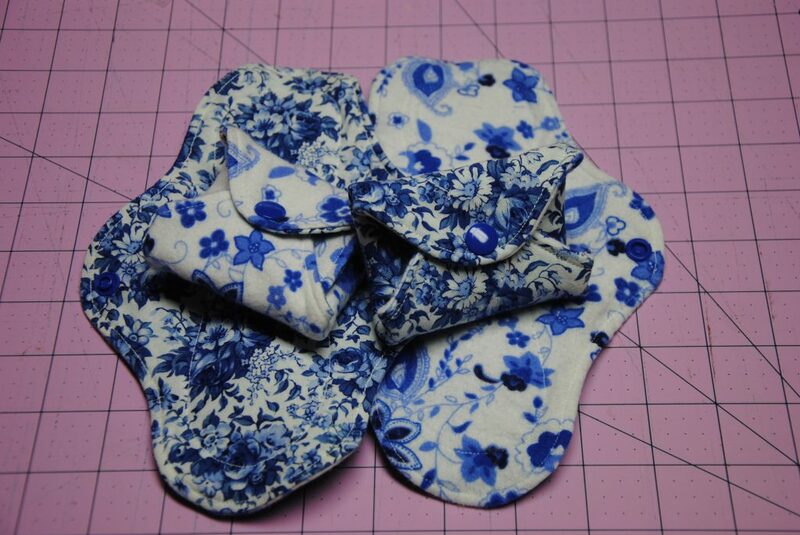 The reason I have chosen to add Menstrual & Incontinence pads to my available products, is that despite the convenience of what we have on the market for one-time use, they are costly as well as full of chemicals. 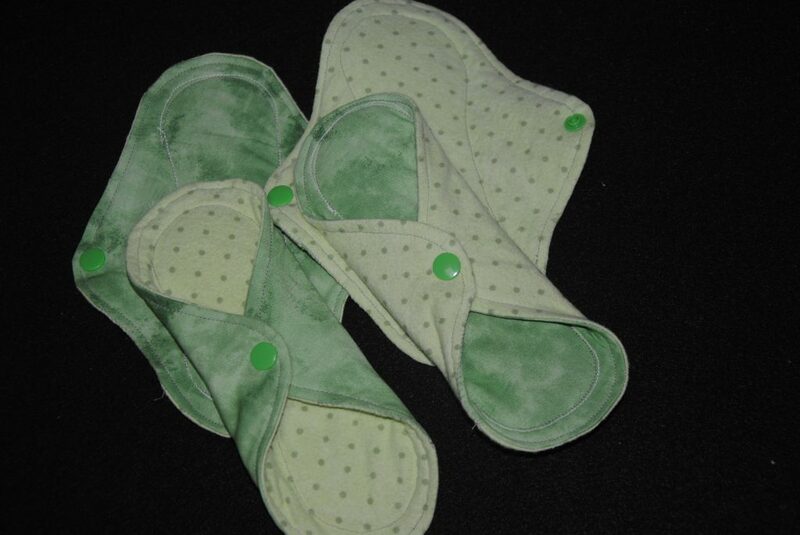 Not good for our sensitive areas or for our environment. 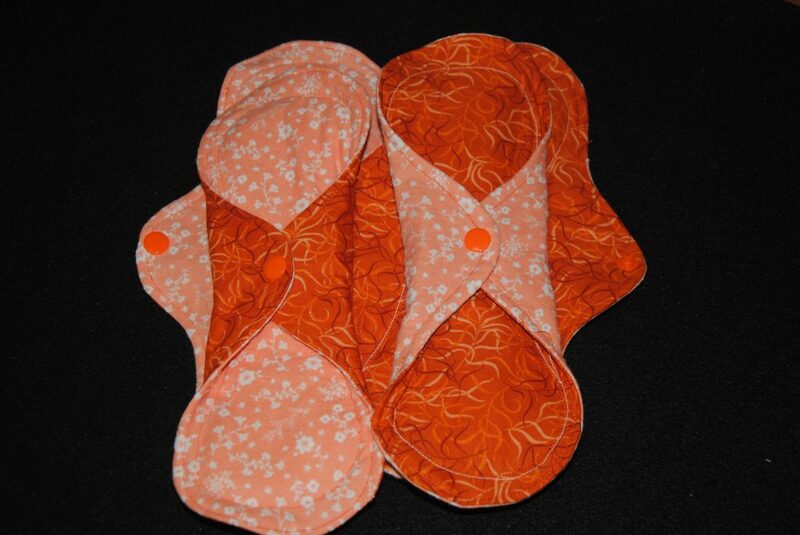 Although the cost to purchase reusable pads might seem expensive, the benefit of having something that is reusable and easy to wash, will stretch ones resources further. 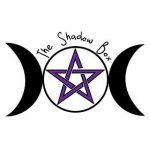 Please scroll to the bottom for information on the materials that I use and work with, in creating these products. 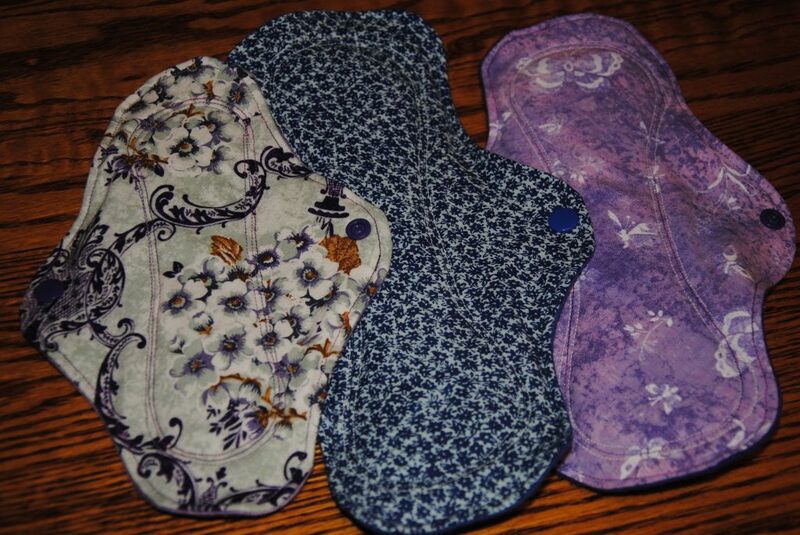 Depending on size and absorbency, the price will vary, with them starting at $15.00 each. 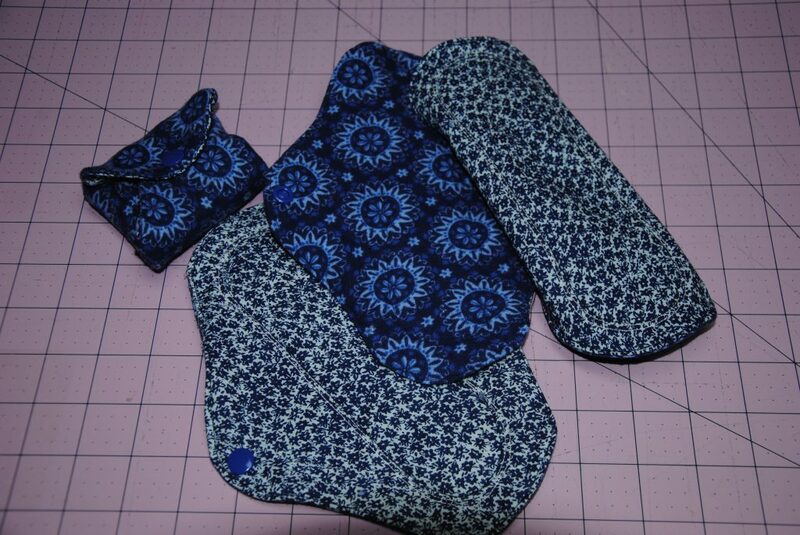 SOLD: The following sold Sample Set, was requested as a gift idea for ones sister. 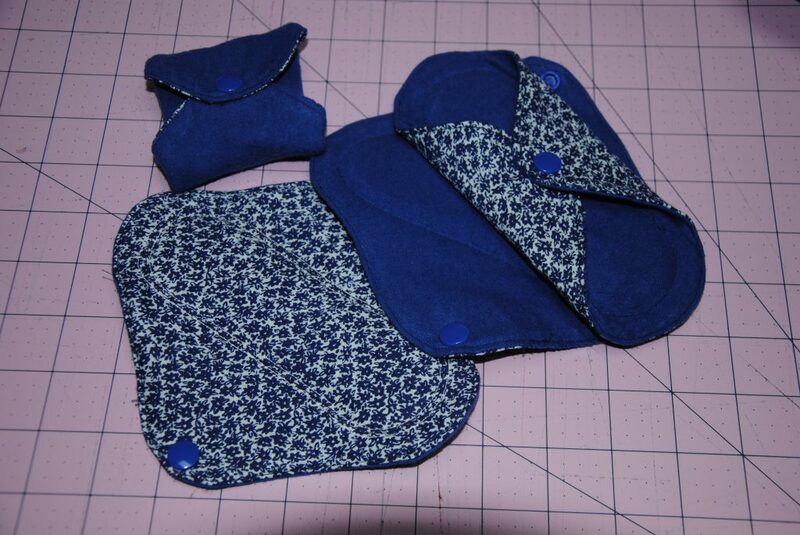 The customer picked up the sample set and delivered to NY while visiting her sister over the weekend. 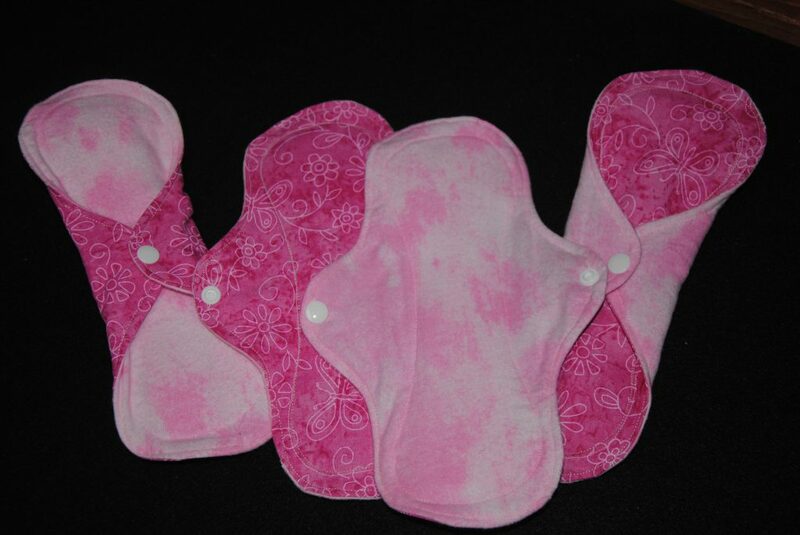 The larger two sizes (10 1/4 and 11 3/4″) were super absorbent, and the 9″ was Moderate-Heavy, in order for her to try and see how they work for her specific needs. 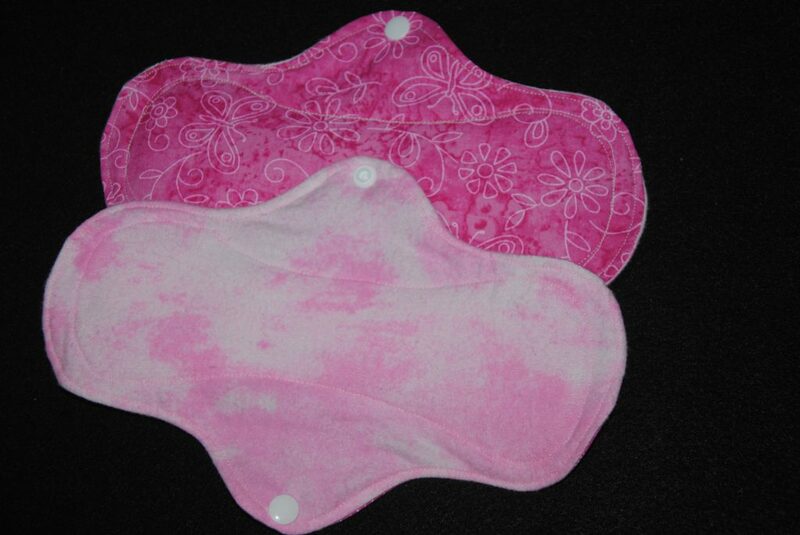 BELOW: SOLD – A set of 2, heavy-to-super heavy pads. 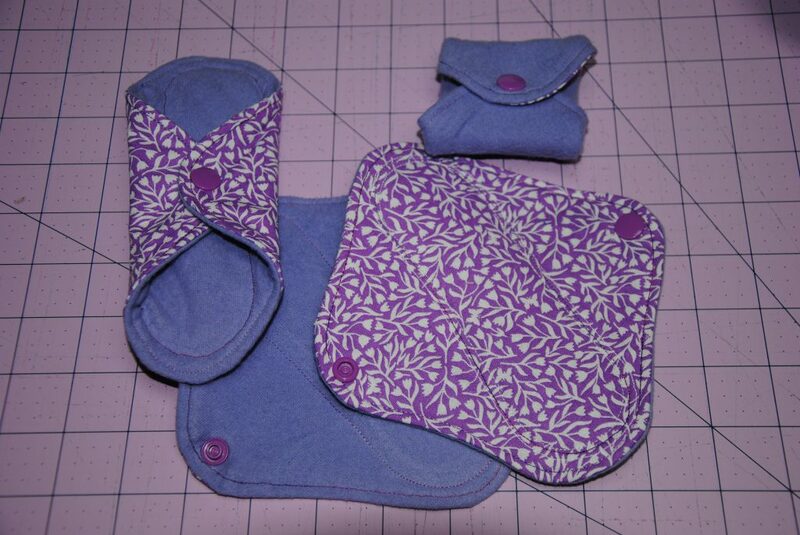 A pretty purple 100% cotton print, with a light, pastel, 100% cotton flannel purple print on the bottom side. 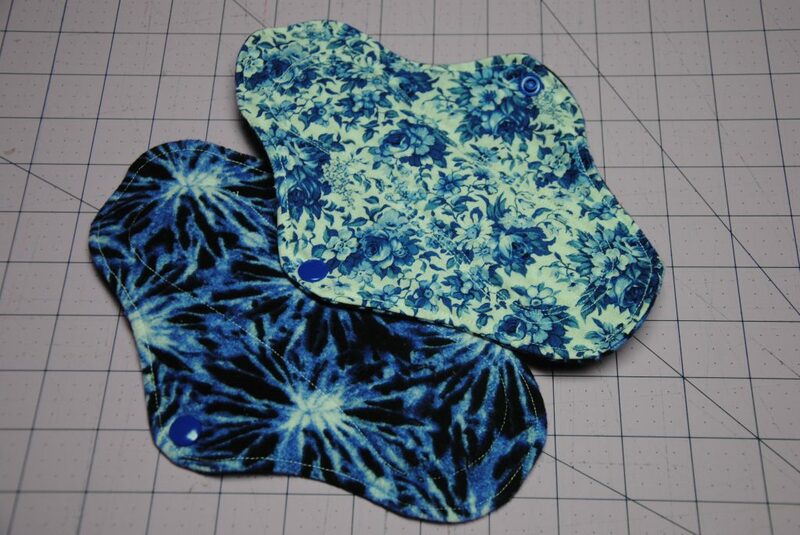 Inside there are 3 layers of 100% cotton flannel with 2 layers of zorb, giving the user confidence for heavy flow and/or leak issues. 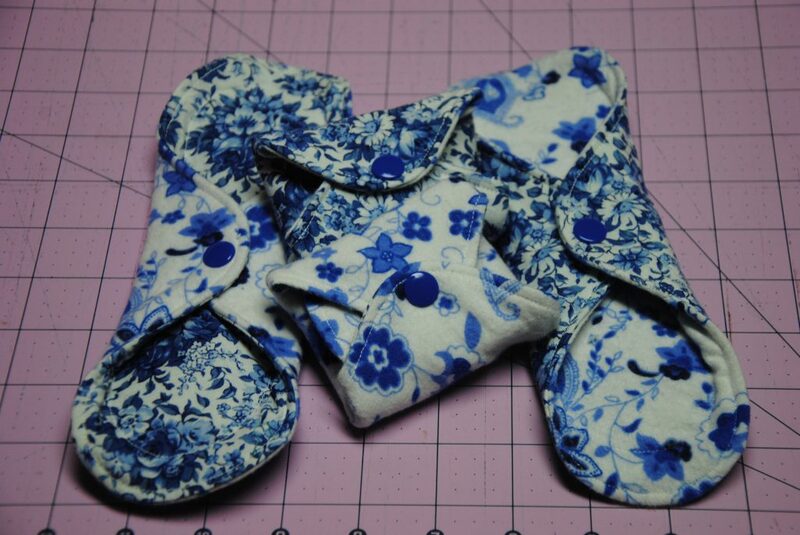 The flannel part goes against one’s undergarment, to help prevent movement in wearing them, while the cotton goes against the skin. 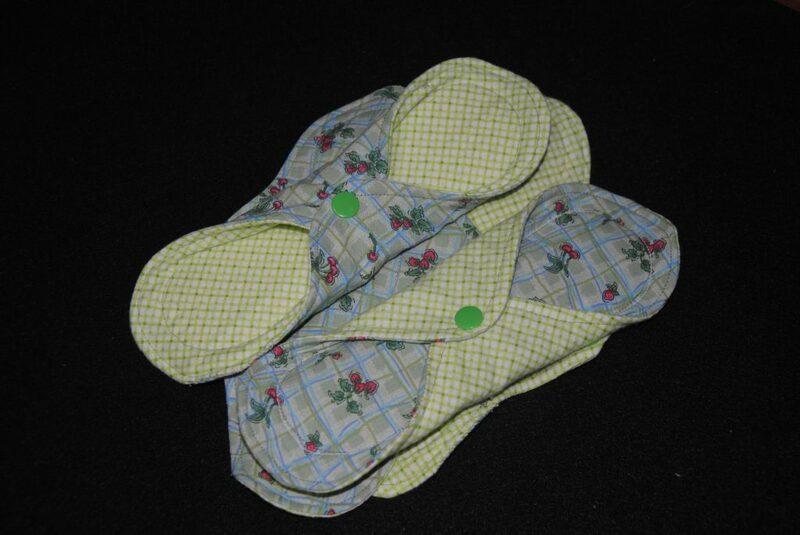 Yet, with the snap holding things in place, if one desires to use the flannel against their skin, it certainly would be fine, providing the same covered protection. 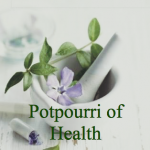 Click on individual photo’s for closer views. 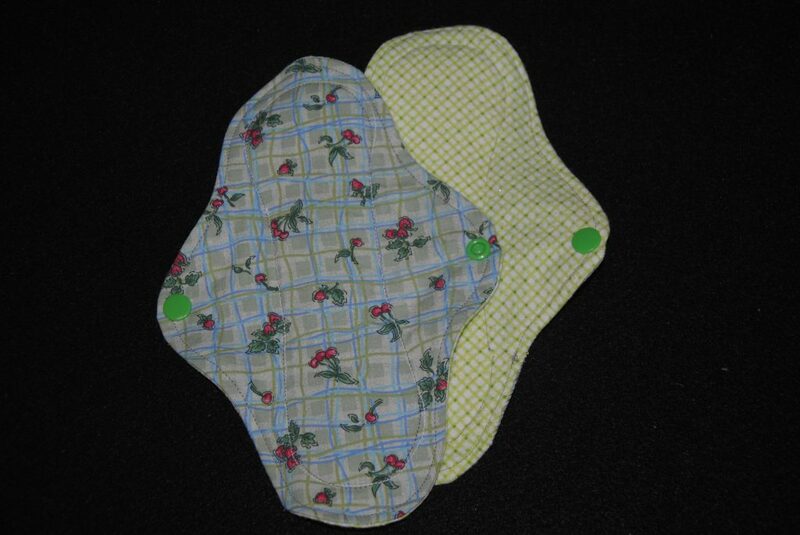 SOLD: Moderate absorbency, 9″ pads. 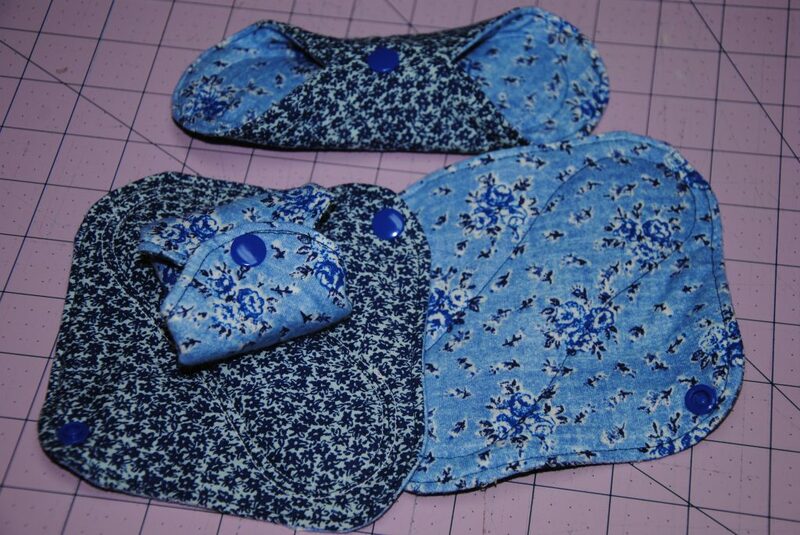 Blue floral fabrics, one side 100% cotton, the other 100% cotton flannel. Inside there are 3 layers of 100% flannel and 1 layer of zorb, all of which will result in moderate to heavy absorbency in a comfortable size. Click on each photo to see enlarged photo. 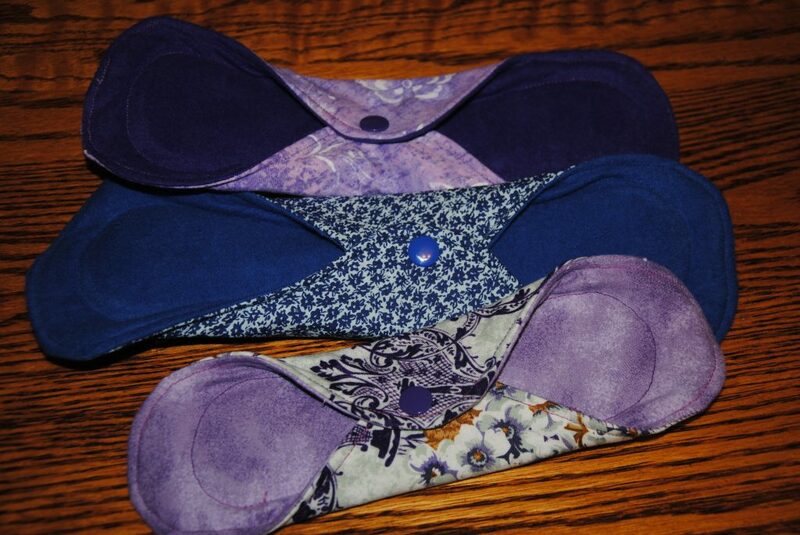 BELOW – SOLD: 4 sets of sizes, each having 4 units each, menstrual pads. 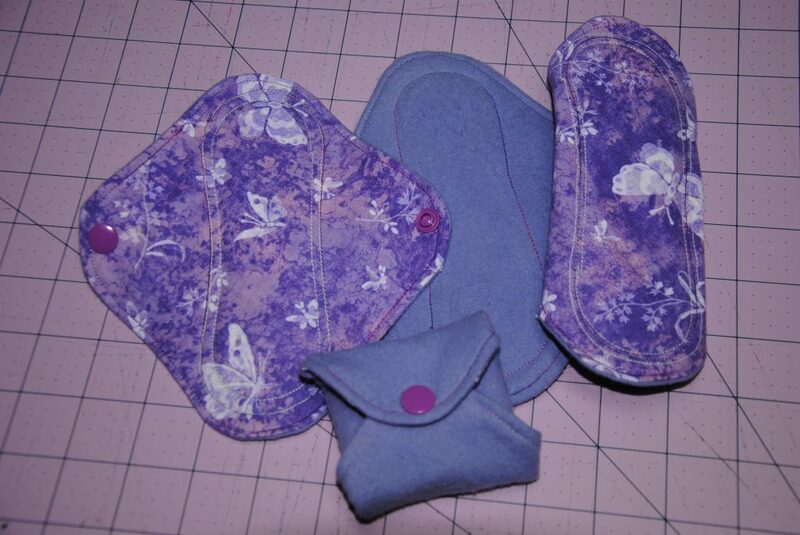 This set is going to a young woman who enjoys earthly colors. 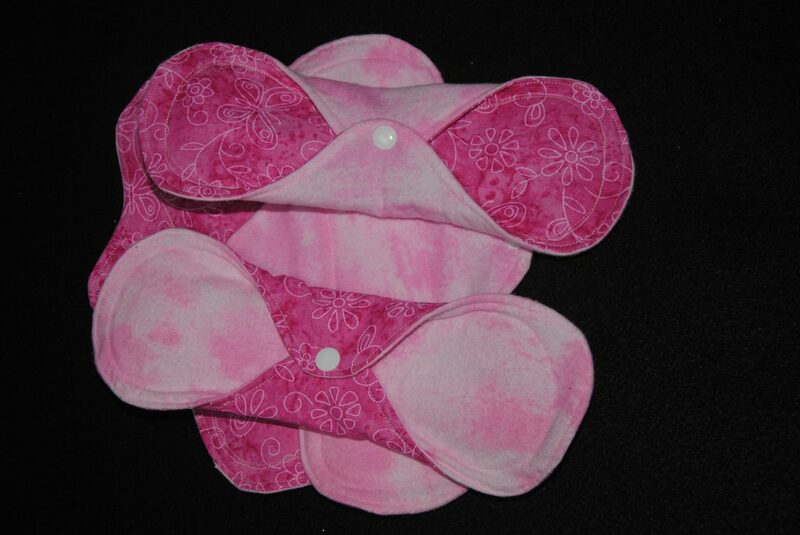 4 – 8″ liners, 4 – 8 1/2″ pads, 4 – 9″ pads, then 4 – 10 1/4″ heavy duty/overnight pads. When requested, she was not too concerned about the colors, but I strove to use some of her favorite colors. 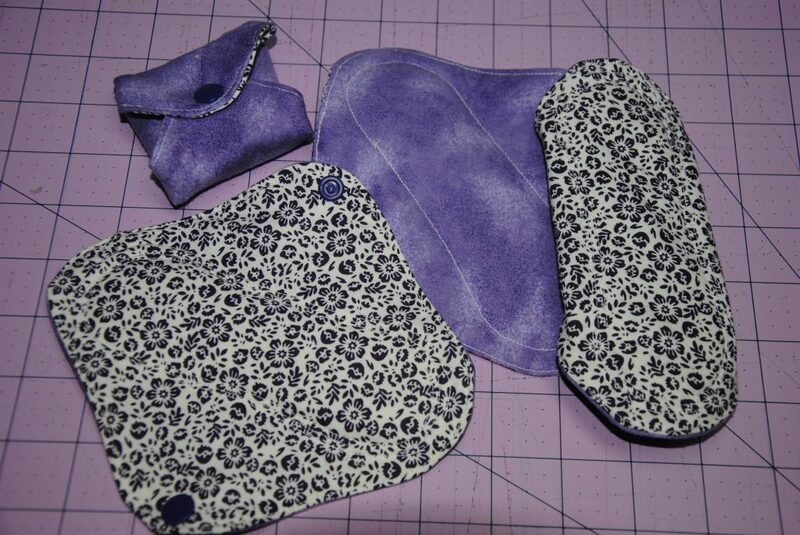 All made with 100% cotton materials and thread. 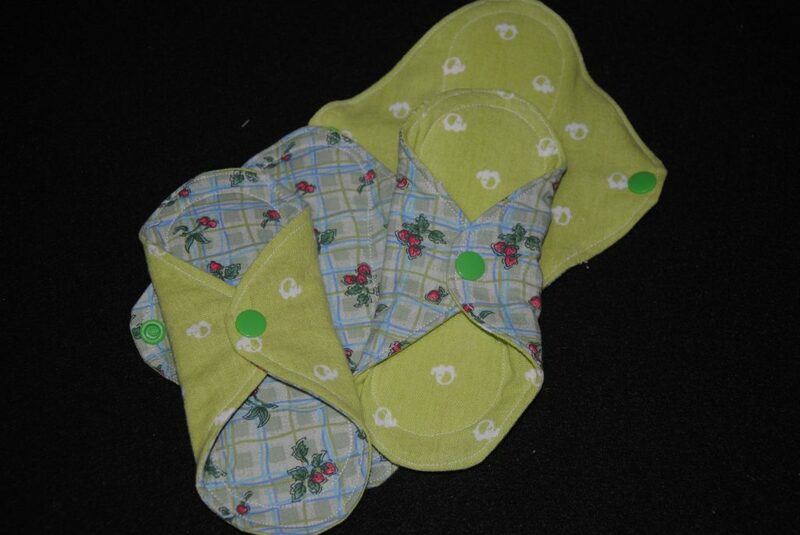 BELOW – SOLD: 4 sets of sizes, each having 4 units each, menstrual pads. 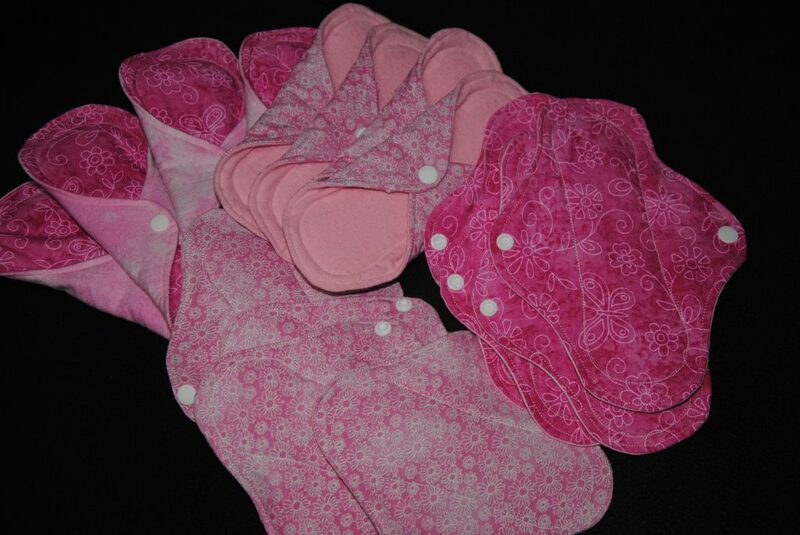 This set is going to a young woman who enjoys pink colors. 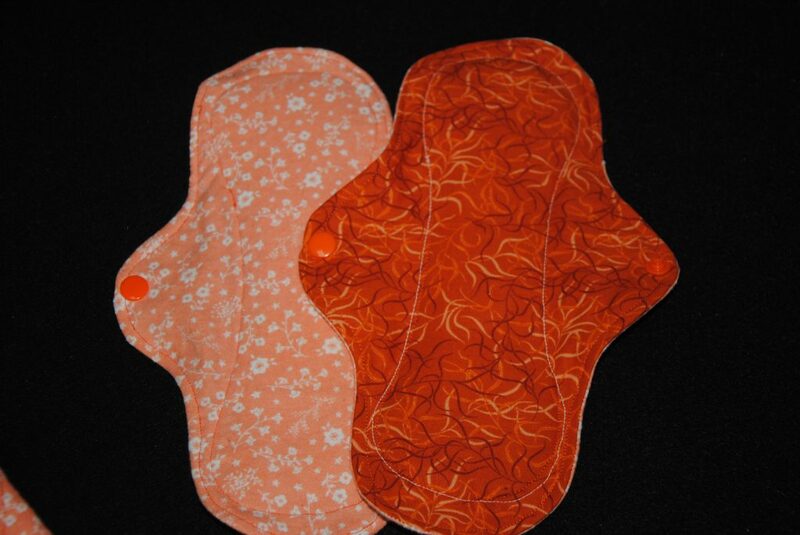 4 – 8″ liners, 4 – 8 1/2″ pads, 4 – 9″ pads, then 4 – 10 1/4″ heavy duty/overnight pads. 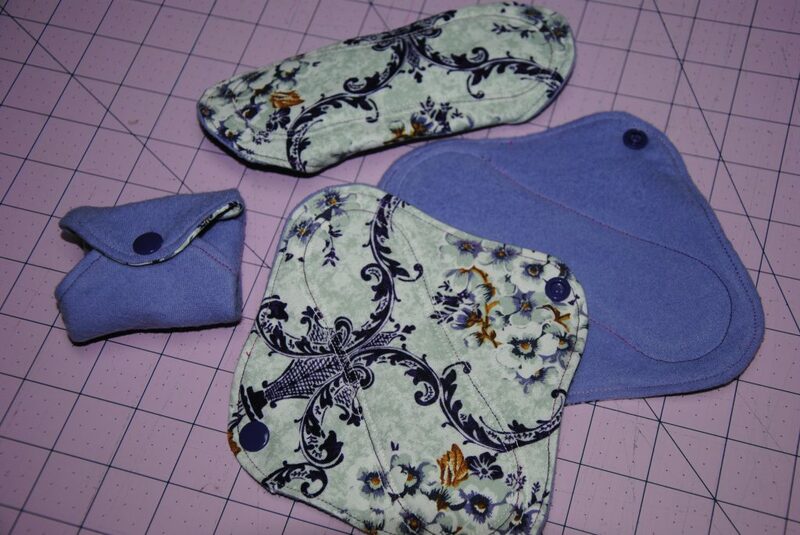 All made with 100% cotton materials and thread. 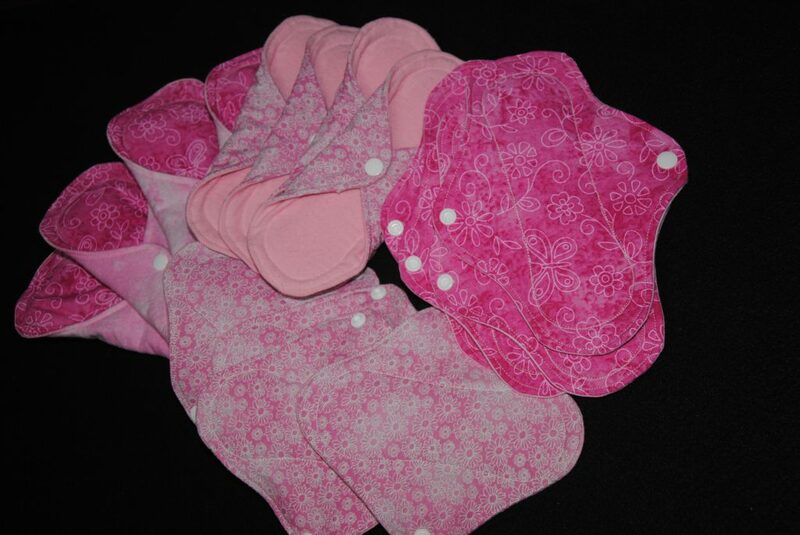 All the pads that I make, are made with 100% cotton materials and 100% cotton thread. 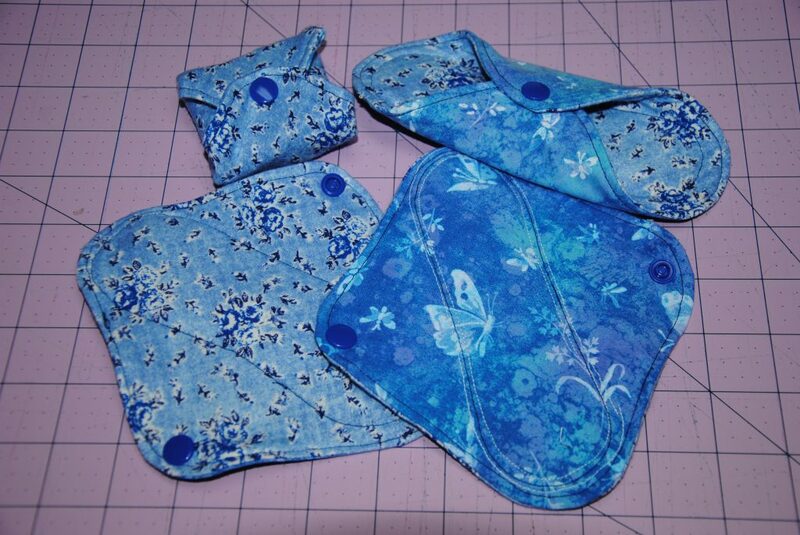 I use cotton flannel, other cotton fabrics, cotton thread and cotton Zorb (absorbent material), and plastic snaps for the wings. 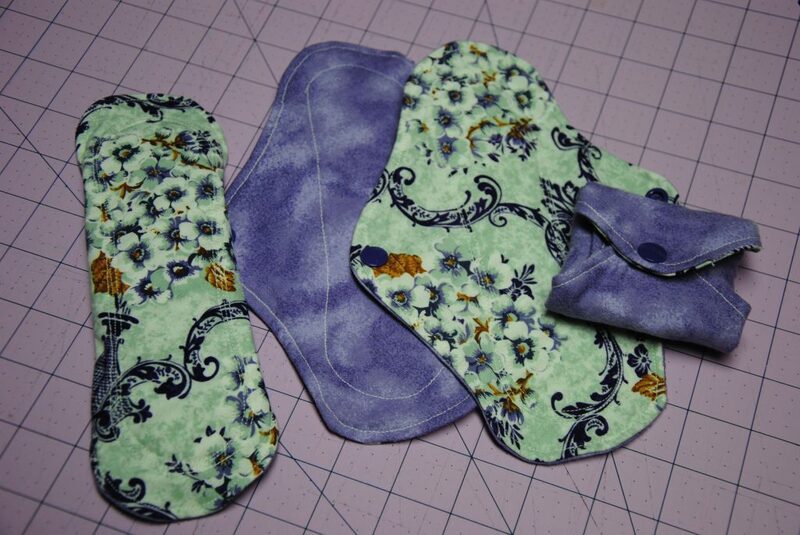 I will be adding some with linen, which is also a natural fiber. 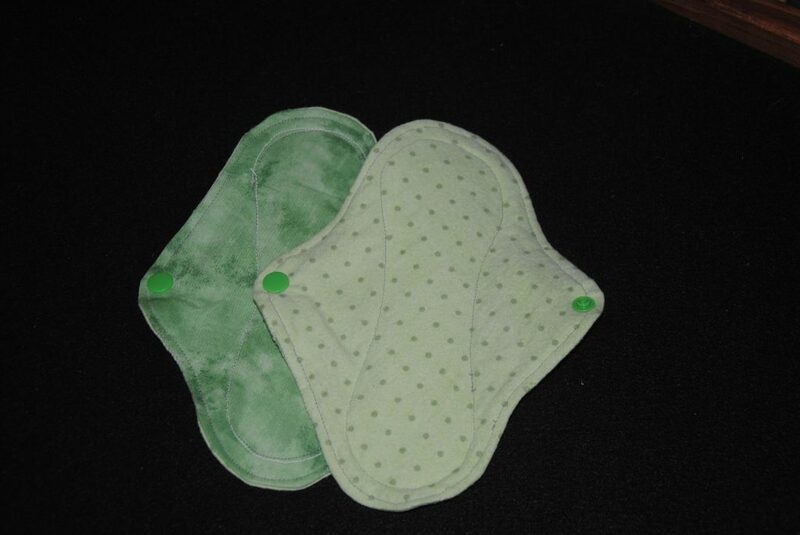 All materials, after 4-6 years of use, can be tossed into the compost bin, yet I would request that the plastic snaps be removed from the pads that have wings. 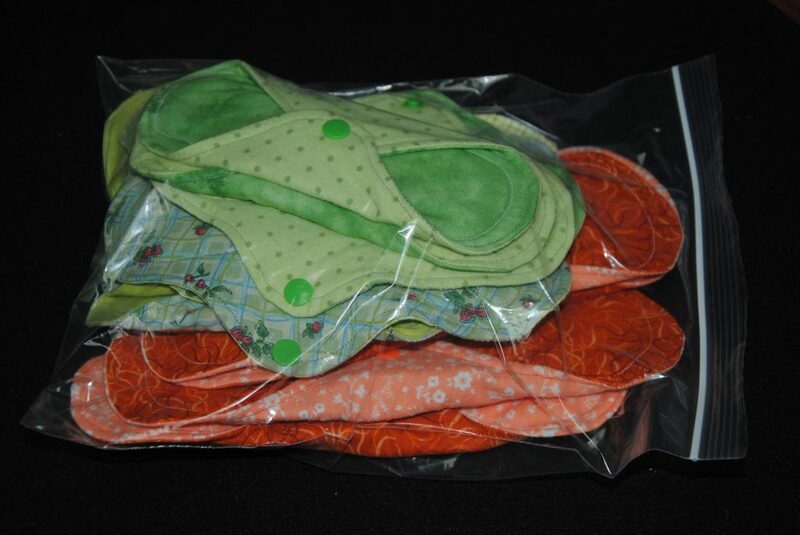 ALL materials are pre-washed in oxy-clean and vinegar, before sewing together (except the Zorb), to remove all chemicals and other potential dirt matter. The inner core, which has a minimum of three layers (2 flannel on the outside of an inner zorb layer) are stitched together to provide a solid center core. 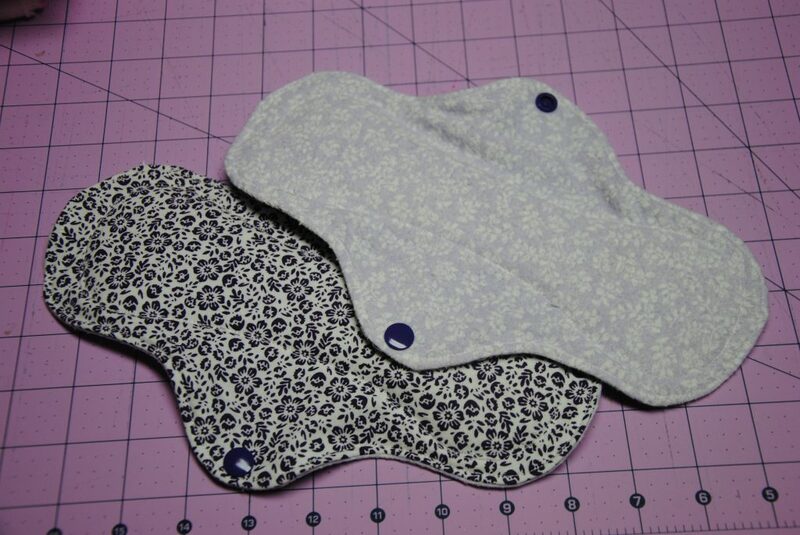 This core is sewn to the outer cotton layer, to secure its place in the center. 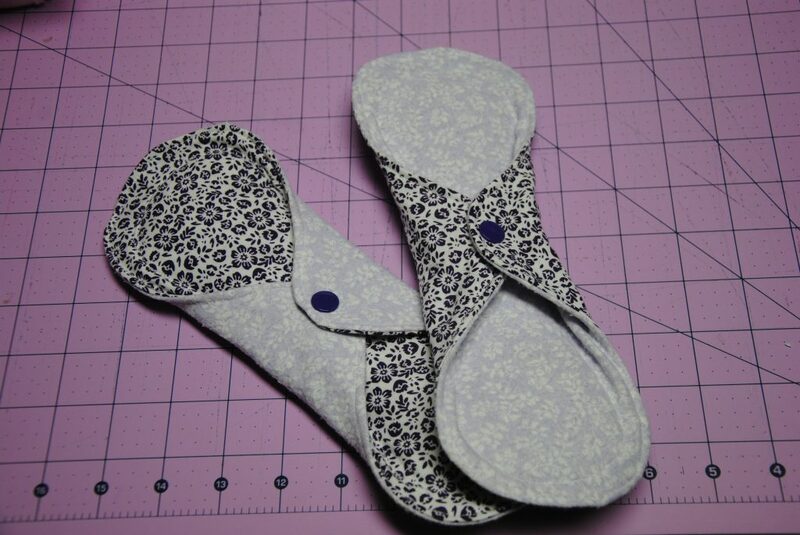 The double-flannel back layer is then sewn on to the top of the outer cotton layer, then the fabrics are turned out, so that the core is inside. Once turned, I hand stitch the opening closed, then top-stitch the edges, as well as stitch around the core a third time. 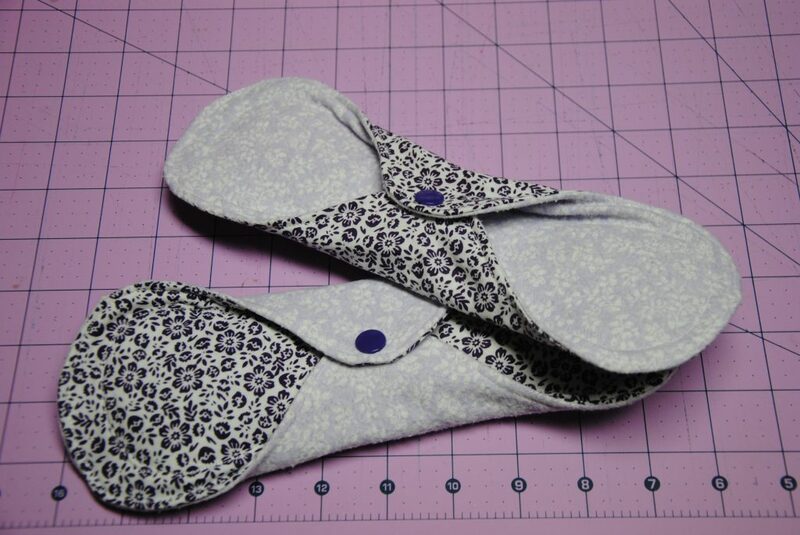 Once this is complete, I am able to add the snaps to hold the wings in place. The snaps? Trust me, you don’t even notice them. Velcro as an option? That would be a custom order. I personally do not like working with velcro, as it is noisy, can irritate sensitive skin, and can snag fabrics in the wash. 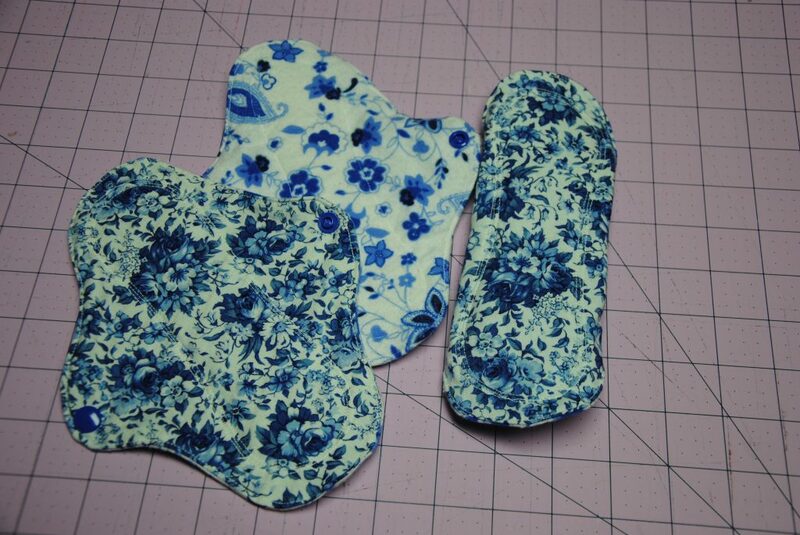 I do not use fleece as an absorbency layer, as I personally find that it keeps the tender areas a bit too warm. Fleece is a great fabric to keep the body warm and pull moisture away from the skin, yet I personally find that I sweat too much when I wear fleece, which can contribute to potential irritation and/or infection. This is why I have chosen to use a product called Zorb which uses cotton fibers and is hypo-allergenic. It soaks up to 20 times faster than other material while absorbing 10 times its’ weight in under 2 seconds. Depending upon the absorbency, I will generally use 1-2 layers of zorb with 2-4 layers of flannel for the core. 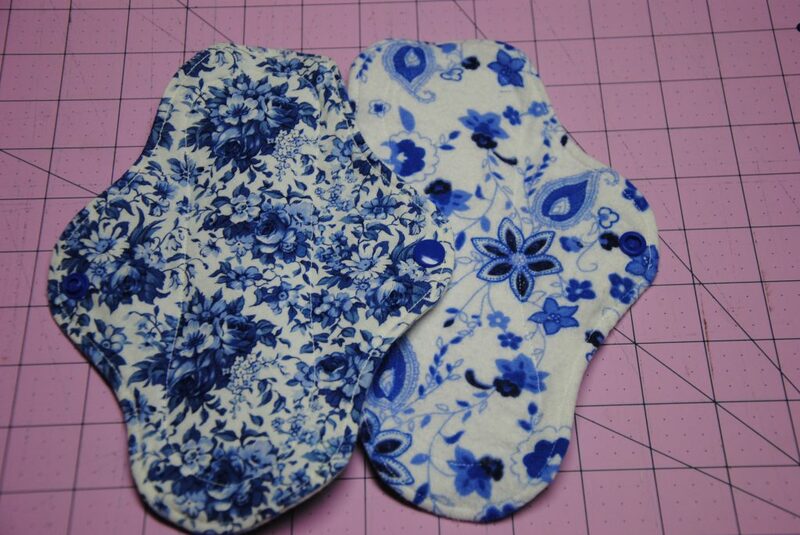 Each pad will have a flannel side that is typically worn against one’s undergarment, with the cotton against the skin. But, since flannel is cotton, if one finds it more comfortable to wear this against their skin, this would be an option of choice. I will be making some with a linen vs. cotton outer layer, as linen is a much cooler fabric, that many in warmer climates will appreciate. Men Formal – Tux, Suits, etc. 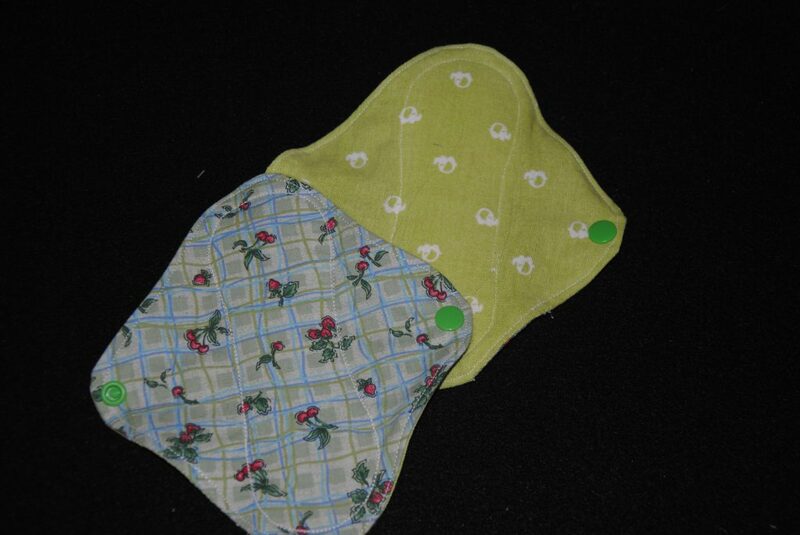 New Life – Gloves, Mittens, Warmers, etc.